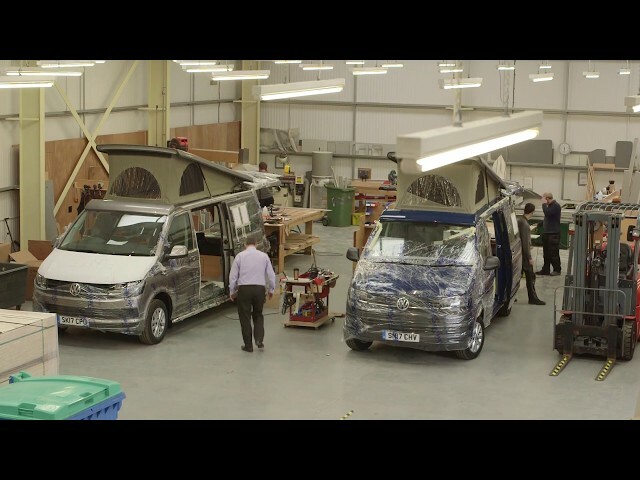 Simon Poole, managing director of Jerba Campervans, based in North Berwick, explains how our innovation support helped the company at different phases of development including the launch of its elevated roof product. "The innovation support from Scottish Enterprise has been fantastic," said Simon Poole, managing director of Jerba Campervans. "You don't just arrive at the door and there's a blank cheque waiting for you. You have to show that what you're doing can really make a difference. "When I started the company back in 2006, it was a classic story of myself, in my own house, in my own drive, converting my own vehicle. After doing a fair bit of research into the market and seeing who my competitors would be, I then saw it was possible to take a step and form my own business. "At the start, I was doing everything – from answering the phones, through to building the website, through to making the product. And in the early days, I took on a one other guy to work as a carpenter. "Now, we’re producing nearly 50 vehicles a year – they’re going across the whole of the UK. And we’ve already built up a strong brand and good brand presence in the high-end of the market. "We’re looking to expand again and Scottish Enterprise has been fantastic at helping us with different phases of development. Innovation is one area where we’ve developed our own individual product for the elevating roof side of the campervan." What part does innovation play in your business? "To me, innovation features widely across the business," said Simon. "I’ve always seen innovation as not just about some big invention. It’s about all parts of the business. "I’d say we innovate continually in communications, so we communicate better with customers – whether it be through marketing or customer service. We also communicate better between members of staff. "It’s also about the products we produce. We’re always looking to improve. We’re looking at what our competitors do. We look at what our suppliers provide. And we try to make the products better. "We also innovate on processes and this has been a strong part of our business growth. We look at how can we improve on the way we do things, how can we be more productive, how can we work smarter. And how can we produce a product that, which when it goes out of the door, does what it says, so that it doesn’t present ourselves with all sorts of issues after." What’s helped you get to where you are now? "The support we’ve had has been financial. We’d spent a great deal of time and a lot of money ourselves and invested on developing our new elevating roof. Before taking it to market, there were some refining aspects that needed to be done. "Scottish Enterprise were great through their By Design grant scheme. It allowed us to do those final parts and invest that final bit of money, so that we could take the product from the stage it was at, to a product that was ready to sell and take to market." Simon said, "I’ve always considered innovation as, not just that big question of finding out some fantastic invention. It's incremental. "Yes, I think we’ve improved enormously on the product. And we’ve gained a patent which is great, but innovation also opens new opportunities. Opportunities for new areas of the business that I didn’t really think about when I started down the road of ‘let’s improve this product we’ve got’." "The innovation support service are very good at listening, but at the same stage critical as well", said Simon. "I think that’s very important. You don’t just arrive at the door and there’s a blank cheque waiting for you. You need to show that what your doing is making a difference. And if you can show that you’re an innovative and growing business, then they’re very happy to get behind you." Want to explore new ways of working and attract opportunities to grow your business? Get in touch with our innovation specialists. We’re always ready to help.